Inspired by seductive and mysterious imagery of Martian deserts gathered by NASA’s Mars Reconnaissance Orbiter, this proposal produces an alien landscape on earth. 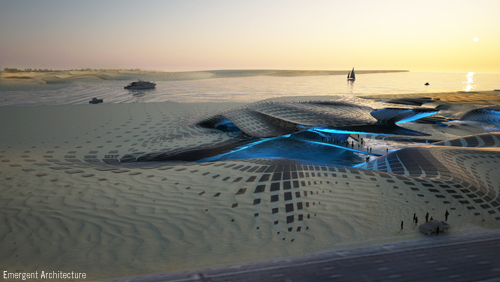 The design consists of a field of artificial sand dunes made with pneumatic membrane bubbles covered with layers of sand accumulated from desert winds over time. The bubbles act as scaffolds for shaping sand at a massive scale. 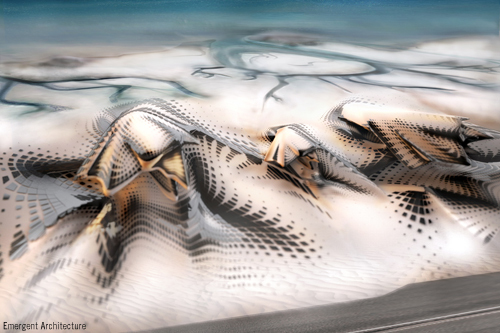 Extreme wind-formed and under-cut morphologies drive the design, reminiscent of Martian dunes, which are built up in layers of frozen carbon dioxide and sand. The windward sides of the dunes are aerodynamic and embedded in the ground, while their leeward sides are crystalline and cantilevered. The bubbles are made of fitted, welded polyethylene membrane- similar to clothing patterns- so they take specific shapes when inflated. High-pressure air-beams sewn into the bubbles give additional overall support and help articulate crease and fold lines in the bubbles. Depending on whether or not the installation will need to be moved, the bubbles can either be kept under constant pressure or permanently hardened using carbon-fiber pre-preg technology. Bubbles will be tied down to the ground with a tension net embedded with a vascular hydronic system. The ground is a simple foundation of sand, hardened through a microbially-induced chemical reaction. No heavy foundations or superstructures are needed. Everything required for construction can be folded, rolled, or otherwise compacted for delivery to the site, similar to the way large structures in outer space are deployed. For the amount of volume constructed, the embodied energy required is extremely low. Like Robert Smithson’s Spiral Jetty and other land art projects from the 1970’s, this is a project where scale matters, and the scale is tremendous. It is Google Earth scale. Nevertheless, underneath the flying dunes are deep shaded areas and lush grottos at the human scale, making the piece visitor friendly. Water inlets, which feed these grottos and provide evaporative cooling, also supply water to the vascular nets. Moreover, by breaking the hard edge of the site boundary, these inlets will allow for aquatic ecologies to develop on the site over time. Thin-film solar cells appear and disappear in striking patterns across the dunes. Their pattern simultaneously responds to the path of the sun but also to painterly concerns. The image is therefore not one of technological efficiency, but of something vibrating between geology, technology, and synthetic ornament.